This scenario features an offline Orbital Defense Laser surrounded by buildings with Intel items inside. 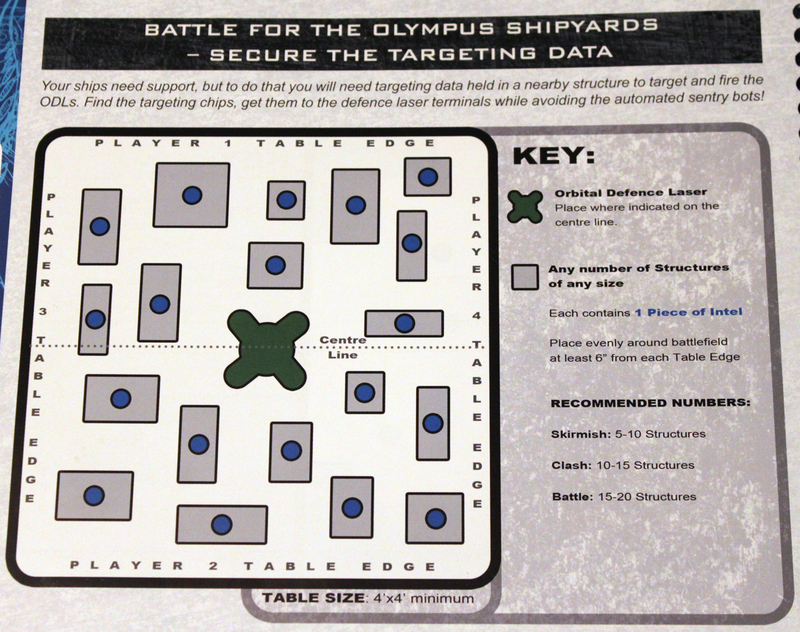 Each player will take a complete edge of the map for deployment and is looking to find information on the data keys (intel- automatic 1VP) or the data keys themselves (objectives- 2VP). 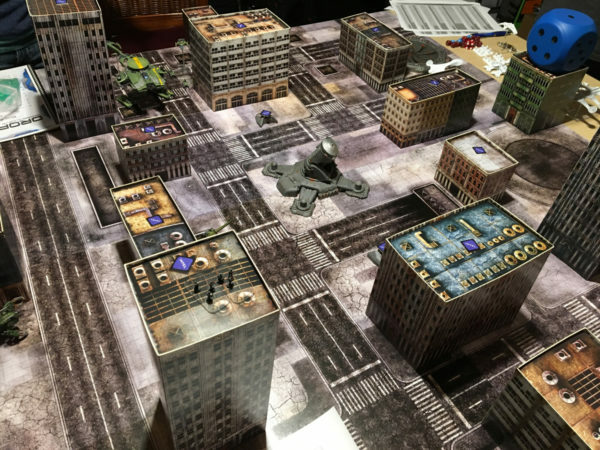 If you hold an objective until the end of the game (6 rounds) or take it off your board edge, you gain 2 VP. If you have infantry hold it and bunker down into the laser structure, it becomes 6 VP at the end of the game. 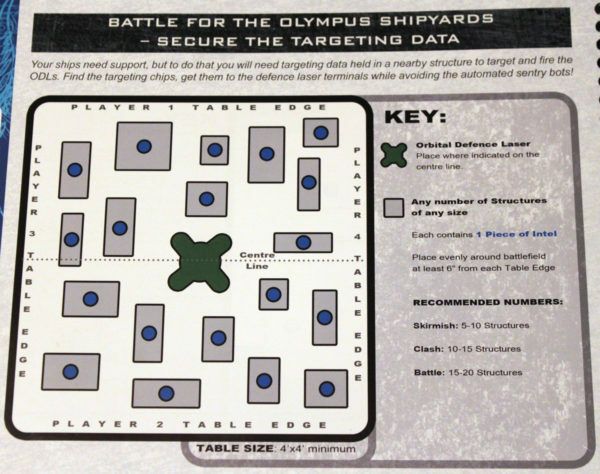 To determine what you find when you search for intel, you roll and the chart will say if you found intel or an objective or “Sentry Bots” which act like a special type of fauna using the Daggers stats. The scenario didn’t define the laser structure so we assigned it the same values as in previous laser scenarios (9 Armor, 20 damage points, active countermeasures, 10 garrison value). With all those details down, I was able to create a list for the first time. 1,250 points is what we’d been doing in first edition so we kept on with that trend. Even though a lot of the system is the same and they streamlined the army building, I still felt like the task was very cumbersome. The “streamlining” comes in the fact that all factions have the same army and squad building parameters. While first edition was awkward in that one faction could build differently from another, it wasn’t any more complicated unless you were building lists from multiple factions. Once you understood your faction’s parameters, it was fine. Now that they gone all homogeneous, it means I have to relearn how get the squads I like to run into the same army. A couple of other items slowed me down and the biggest one is no dedicate army building program. I don’t even need something to point out errors, just something to quickly calculate costs and the ability to move the numbers around until the army works out. I ended up putting together a very basic version in the unit stats spreadsheet so that is what added a lot of time to the list build. Lastly, there are some elements to the building process that just aren’t in the book anywhere. Namely, the ability to pay for your commander and the rank level you want to take. We eventually had to go back to first edition and proxy those values. Other things like the new airstrike costs replacing the old editions “fast movers” options are separated from the army building section in the rules so it makes for a slow process trying to make sure you have everything correct. This list didn’t come out like I’d hoped but it allowed me to play with some new units and see some of the changes to existing squads. The two newest items for me were the Sappers and the Pizarro walker. Both of these units have “infiltrate” so they don’t need to have a transport at the beginning of the game. This makes them much cheaper than other options as they won’t suffer any “transport tax” as they will directly deploy onto the battlefield. 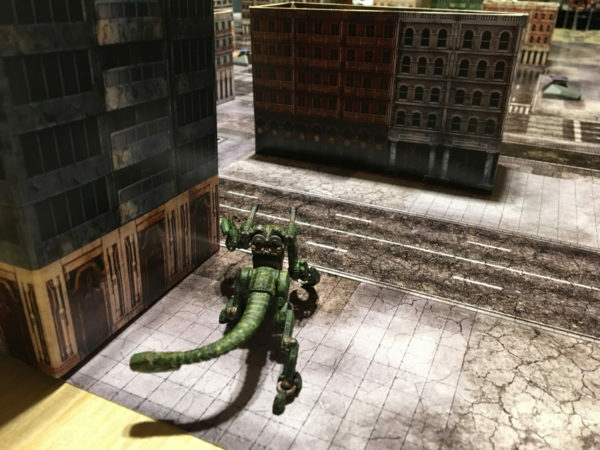 For Sappers, this is great as they can scope out a defendable building and start, ready to rock. For the walker, this is interesting as he is a little slow but I have so many Kraken hovercrafts in this list, he can always jump in and surf one of those down the road if he needs to. The unit I was most curious about was the Attack ATVs. The radically changed the unique feature it had before, replacing the upkeeping chemical token mechanics from the previous edition with a “counts as” flame weapon but nerfed so that it can’t cause “fire.” The new “fire” rules actually act a lot like the old chem grenades so it seems to have the same weapon and lose that unique mechanic only to see every other unit with “flame” now gain it. It also has a bizarre “incendiary grenade” option that’s sole purpose is to light structures on fire. It can’t damage anything in the game (except for some weak infantry) but I guess if you really need to light something on fire, it has the option. We’ll see how that all shook out in my session report coming up later in the week. Other than those new units, everything else looked to function the same as before. The command unit, M3 Alexander tank, got a little nerf as it no longer has a big AOE weapon but otherwise looked unchanged. Freeriders remained nerfed hard and maybe are even worse now since they can’t drive on and instead have to wait until turn 2 before they appear unless you put them in one of the most expensive transports in the Resistance army (or roll the dice on getting a drill to pop up on turn 1, assuming that is even possible anymore). I couldn’t afford the transport so they will be forced to drive on on turn 2. 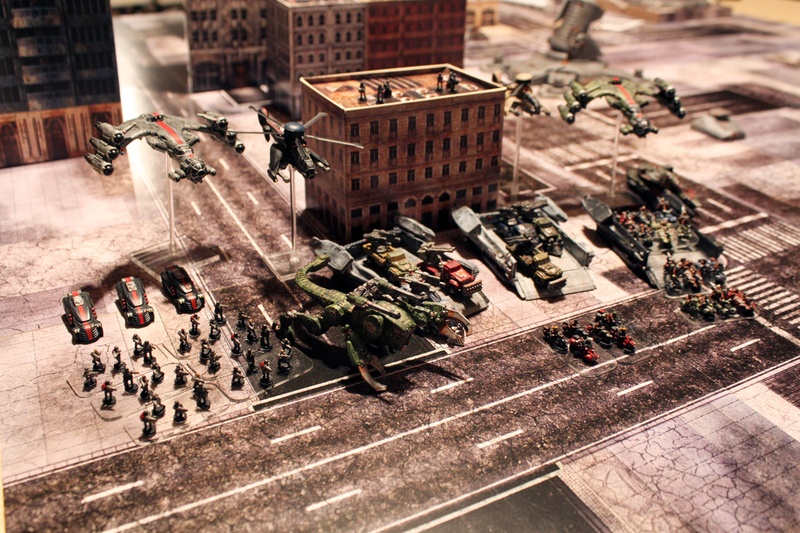 I seemed to struggle to stack squads in battlegroups like you could in first edition. I’m not sure if that is a good thing or bad, just different at this time. It limits options which is never good unless it severely hinders balance but maybe it combats longer downtime since you won’t be able to have long activations with a ton of squads stacked in a single battlegroup. Again, something to see as the game progresses. That is about it for the setup and army building. Next, I’ll throw together a session report on the game itself.